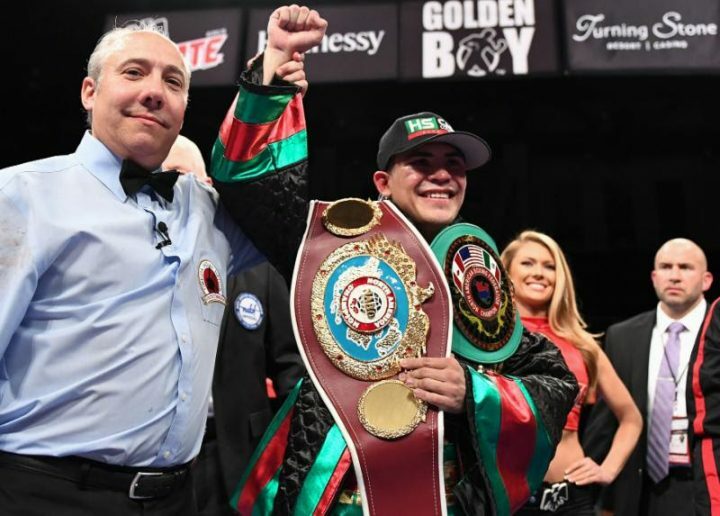 Diego De La Hoya (21-0, 10 KOs), the quick-handed super bantamweight contender of Mexicali, Mexico, successfully defended his NABF and NABO Super Bantamweight Titles against Jose “Sugar” Salgado (35-5-2, 28 KOs) of Cozumel, Mexico via technical knockout at the end of the seventh round of the scheduled 10-round main event of the June 8 edition of Golden Boy Boxing on ESPN at Turning Stone Resort Casino in Verona, N.Y. De La Hoya’s relentless and fast-paced aggression were too much for Salgado to handle, which forced his corner to call a halt to the bout at the end of the aforementioned round. In tonight’s co-main event,Travell “Black Magic” Mazion (13-0, 11 KOs) of Austin, Texas retained his undefeated record as he beat Orlando, Florida’s Daquan Pauldo (17-2, 9 KOs) by unanimous eight-round decision. Mazion won with scores of 77-75, 77-75 and 78-74. Danielto Zorrilla (7-0, 6 KOs) of Rio Piedras, Puerto Rico delivered a devastating left hook to the body to defeat stop Julio Perez (4-3) of Aguadilla, Puerto Rico in the first of a scheduled four-round super lightweight fight. Golden Boy Promotions prospect Alex Rincon (4-0, 4 KOs) of Carrollton, Texas scored two knockdowns en route to a first-round technical knockout victory over Engelberto Valenzuela (11-14, 3 KOs) of Agua Prieta, Mexico. The fight, which was originally slated for four rounds at the middleweight limit of 160 pounds, was stopped at 1:35 of the aforementioned round. Lawrence Gabriel (3-1-1, 2 KOs) of Syracuse, New York scored a second-round technical knockout victory against Jimmy Blevins (0-3) of Buffalo, New York in a fight that was originally scheduled for four rounds in the heavyweight division. Isaac Rodrigues (25-2, 20 KOs) Mocajuba, Brazil stopped Frankie Filippone (25-8-1, 9 KOs) of Chesapeake, Virginia in the fourth round of an eight-round light heavyweight clash. Rodrigues scored two knockdowns, the second of which forced the stoppage at 1:46 of the fourth round. Armus Guyton (1-0) from Ithaca, N.Y. defeated Mike Diorio (0-1) from Cortland, N.Y. by unanimous decision in the opening bout, a four-round cruiserweight contest. Both fighters made their professional debut in a fight that Guyton won with scores of 39-37, 39-37 and 40-36. De La Hoya vs. Salgado was a 10-round super bantamweight fight for the NABF and NABO Super Bantamweight Titles presented by Golden Boy Promotions and Don Chargin & Paco Presents. The event was sponsored by Tecate, “THE OFFICIAL BEER OF BOXING” and Hennessy, “Never Stop, Never Settle.” The fights took place on Friday, June 8, 2018 at Turning Stone Resort Casino in Verona, N.Y.